Eco Wave Power signed a PPA (Power Purchase Agreement) with the Government of Gibraltar and the Gibraltar Electricity Authority in the scale of 5MW. The construction was co-funded by The EU Regional Development Fund as well as private investments groups. In May, 2016, EWP and the Government of Gibraltar held an official opening ceremony of the newly constructed wave energy power station on the east side of Gibraltar. 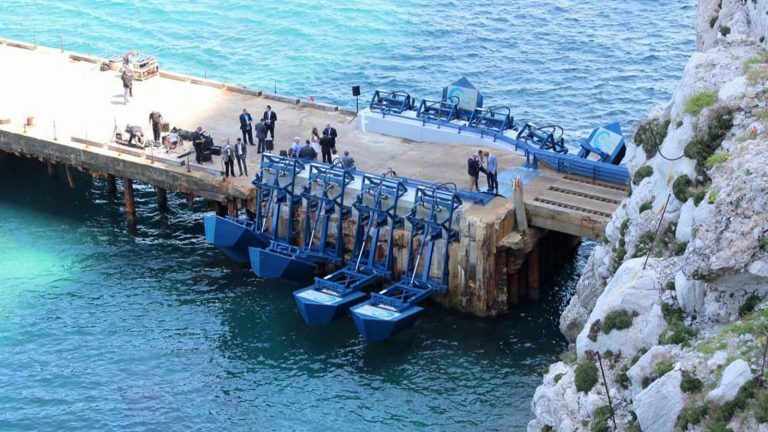 Since 2016, Eco Wave Power is operating Europe’s first grid-connected wave energy power station in Gibraltar, which is operating through a PPA (Power Purchase Agreement). The station was co-funded by the European Regional Development Fund. The station’s current installed capacity is 100kw, which is part of a 5MW PPA signed with the Gibraltarian Government and Power Authority. Upon completion of the entire 5MW, the station will provide Gibraltar with 15% of it’s energy needs. The current 100kw station, uses EWP’s patented wave energy technology. The technology is a onshore based point absorber system which is comprised of floaters attached to pre-existing man-made marine structures through robust mechanical arms. The station is currently comprised of eight floaters and a control station located on the Ammunition jetty in Gibraltar. Ammunition Jetty, situated on the East side of Gibraltar. Eco Wave Power signed in 2014 with the Gibraltarian Government and the Gibraltar Power Authority on a Power Purchase Agreement ("PPA") of 5 MW. According to the PPA, the first milestone to complete was the connection to the grid of a wave power array in the capacity of 100kW. Upon successfully completing the 100kW installation, the company will continue to develop to a full scale 5MW plant. EWP connected the 100kW wave energy power array to the Gibraltarian electric grid in May 2016, and since then has been producing and selling electricity to the grid through the station according to the terms of the signed PPA. The company expects to continue to the development of the whole 5MW in the nearest future. The power stations operate in accordance to the terms of the PPA signed with the government and Electricity Authority. The duration of the PPA is 25 years with a mutual option for extension of 5 years. EWP’s floaters do not connect to the ocean floor, and do not create any new presence in the ocean. EWP only connects its’ floaters to existent man-made structures. There is no underwater mooring or underwater electric cables. Eco wave power will have no additional environmental impacts due to this. In addition, Eco Wave Power uses biodegradable hydraulic fluid. Specifically, in Gibraltar, on the cliffs adjacent to the power station, there are scores of nesting birds which are protected by the local authority. Therefore, the company does not interfere with the local bird population by not using high structures and by not utilizing aerial drones. Eco Wave Power wave energy power station Gibraltar is located in United Kingdom.